As Revd Ian said this morning, God can very often surprise us. St Alban’s is in for a surprise! A big change. But I am as certain as one can be, that we are now ready for it. At this moment in St Paul’s Hampsted, in Birmingham, an announcement is being made that their Vicar is leaving them and moving to Copenhagen. But going back 2½ months, on 5 December 6 people sat in the Diocese office in London – Bishop David, Archdeacon Colin, Area Dean Nick, The Applications Officer – herself a priest, and the two elected parish representative – Nigel and I.
St Alban’s vacancy notice had attracted 8 formal applications, 4 candidates had been selected but at the last moment 2 had withdrawn. Rather than dropping the whole process, the Bishop decided we should interview the 2 candidates, both of whom he knew to be eminently employable. After much serious consideration, in the end with full agreement we selected the person to be the next Chaplain in St Alban’s. Her name is Smitha Prasadam – she is a woman, and by her own description she is a priest, theologian, apostle, evangelist and steward. She was born in South India but has lived most of her life in Britain. “As Chaplain, I would be fully committed to offering pastoral care, revitalising discipleship, nurturing a mixed economy through championing the new and treasuring the traditional, offering strategic oversight in this new beginning for St Alban. “Always with new appointments there is some nervousness, which is natural. It is also a process that God oversees ultimately, so as faithful servants we seek to do His will and trust in His care and guidance. 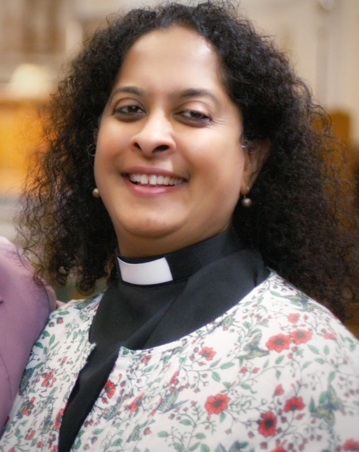 Smitha is a sound priest with an excellent ministerial record and fulfils all the areas the parish indicated as essential, plus she brings a creative mind. I also sensed a person who will be congenial and even fun to work with! I too am certain you will welcome our new chaplain with the warmth and openness you always show to newcomers, and that the next few years under her ministry will make the life of St Alban’s community exciting, interesting and and even more caring place in which to worship. I know Chris has arranged for a parish lunch after her instalment – he and Nigel can tell you more about this in due course. Our new chaplain will be inducted on Saturday 16th of June.